What was having your big toenails removed like? In an earlier post, I promised to share some photos of what my big toes looked like after the nails had been permanently removed by an orthopedic surgeon. You might wish that I'd forgotten about my promise, especially after you see the photos, but I'm fulfilling it anyway! In fact, I've actually gone a step further, as for about the last four months I've taken a photo of them every couple of weeks, hence not only can you see how they looked initially, you can also see exactly how they've been healing! 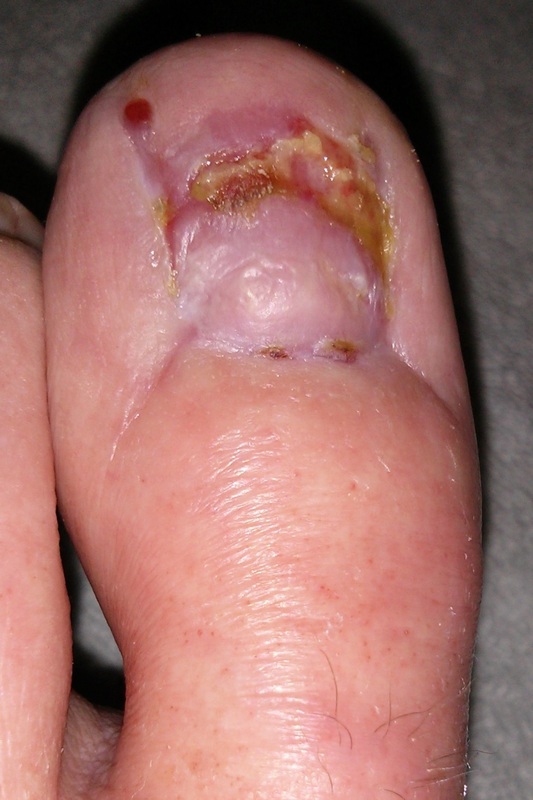 Note: Prior to having my big toenails removed, I was told that the healing process takes between six and twelve weeks for your typical patient, but that it would in all likelihood take a little longer for myself, due to my medical history; As you no doubt remember, I currently take steroids to help keep my skin GVHD under control, and, unfortunately, not only do they increase my risk of infection, they also impair my ability to heal. In other words, the steroids make the procedure riskier and recovery longer! In the early stages of the recovery, one of the nurses commented that my big toes were taking their time to dry-out/scab-over, which meant that I needed to use some iodine dressings for a number of weeks to speed-up that process. I was expecting the iodine dressings to sting quite a bit, but they didn't actually feel any different to the normal dressings really. Having said that, neither were particularly comfortable! In an earlier post, there was a photo of the extensive dressings used initially, and another of the radically scaled-down dressings used after a week or so, and below there is a photo of the plasters (with some gauze underneath for padding etc) that I've used for approximately the last two months. 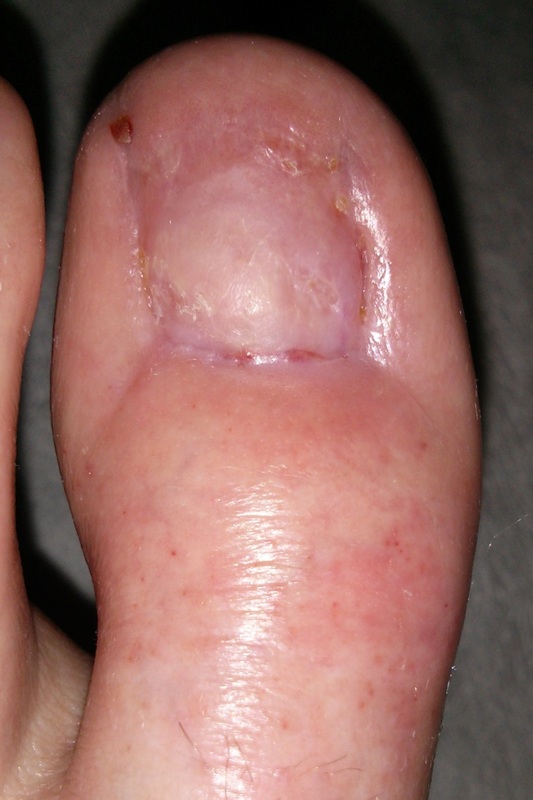 If you view the photo below full size, by simply clicking on it, you will also see how the skin GVHD is affecting my feet, despite the creams, medications and Extracorporeal Photopheresis (ECP) used to treat it. The various dressings used over the last four months have all needed to be kept dry, which has meant that I've only been able to get a shower when the dressings were due to be changed. Initially that was once per week, and later on twice per week, as changing the dressings too frequently (particularly in the early stages) impairs the healing process. As you might imagine, getting washed with a flannel on the other days has certainly given me a newfound appreciation for the inventor of showers! Whilst the dressings do help to mask the sensitivity of the wounds, even wearing socks can still be slightly uncomfortable, as the stitching tends to be exactly where the wound is most sensitive. 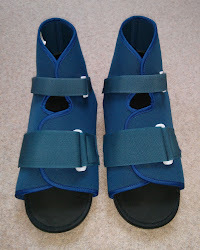 Having said that, what really made my big toes throb was if I didn't keep my feet elevated. 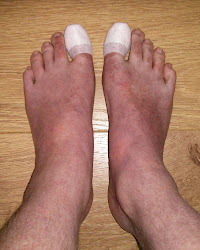 It seemed like standing-up and walking around etc would make my big toes swell, and that resulted in the dressings applying more pressure. 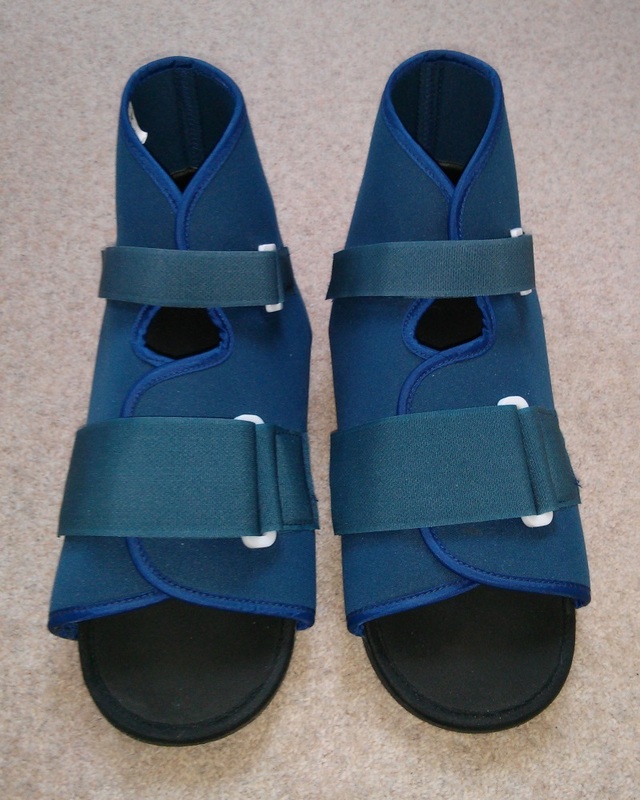 It has only been in the last month or so that I've started to wear my trainers again, instead of the blue strap-on boots (see the photo below) provided by the hospital, as even though my big toes didn't look too bad after a couple of months, they were still quite sensitive, hence avoiding any pressure on them was far more comfortable. In fact, even now my big toes are still a little bit sensitive, but that should gradually fade over time as the skin hardens. 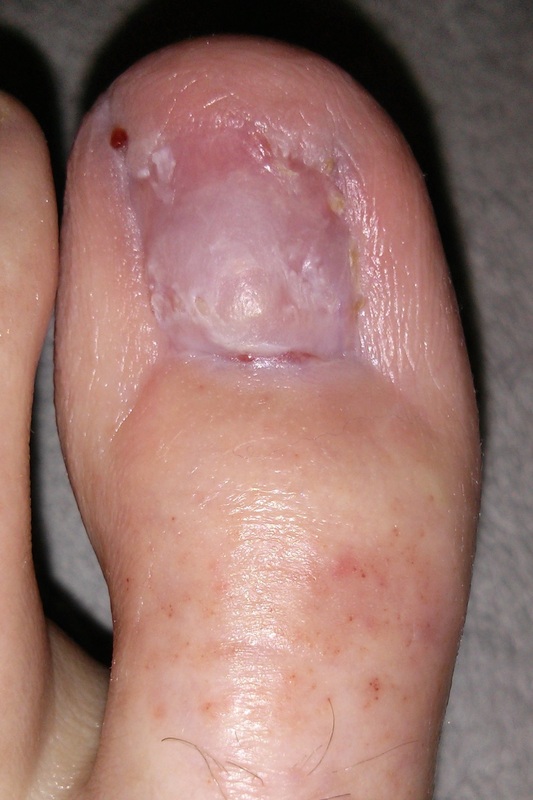 Interestingly, once the skin has hardened, my big toes should be just as well-protected as when they had nails; Toenails don't really serve any purpose these days, so the only consequence of their removal is you have less to cut! Fortunately, my big toes mostly feel fine now, albeit still slightly sensitive. As you no doubt noticed from the photos above, even after eighteen weeks, my big toes still have a small amount of healing left to do (more so on my right foot than my left foot), but I'm now really just hoping that the orthopedic surgeon managed to completely remove all traces of my big toenails, as I really don't want part of them to start growing back again. I'd like to be able to draw a line under the whole ingrowing toenails saga!